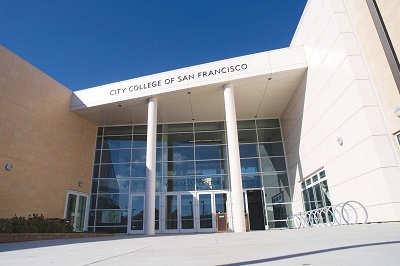 City College of San Francisco (CCSF) is one of the most searched for colleges in America, according to a recent internet keyword search of basic two and four year colleges. San Francisco City College is a public, two year community college, accredited by the Accrediting Commission for Community and Junior Colleges of the Western Association of Schools and Colleges. CCSF is one of the largest community colleges in America, offering courses in more than 50 academic programs and more than 100 occupational certificate programs. 1. Where is City College of San Francisco? 2. What courses and programs are offered at City College of San Francisco? 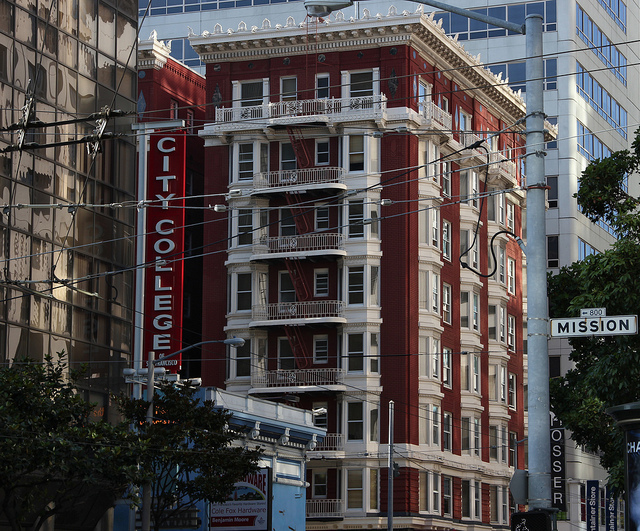 San Francisco City College offers courses in dozens of trades and academic programs. CCSF offerings include Broadcasting, Business, Computer Science, Culinary Arts, Engineering, Fashion, Graphic Communications, Health Care, Nursing, Physical Education, Dance, Women's Studies, and more. Aircraft maintenance and fire science are taught at the San Francisco Airport location. Credit classes taught at the Chinatown / North Beach campus include astronomy, business, chemistry, fashion, foreign languages, geology, health sciences, math, nutrition, and physics. The Civic Center campus offers a wide range of non credit courses. The Downtown location offers credit courses in Architecture, Art, Business, Culinary Arts, Economics, English, ESL, Fashion, Foreign Languages, History, Psychology, and Sociology, as well as a number of non credit programs. The Evans campus features automotive studies. The Fort Mason campus features numerous art classes, which include drawing, painting, sculpture, and photogrpahy. The Gough Street location consists of an auditorium and various administrative offices. Credit courses at the John Adams Center include nursing and health care technician programs. The Mission District location features credit classes taught in Spanish, which include Art, Biology, Biotechnology, Broadcasting, Chemistry, Computer Networking, English, ESL, Interdisciplinary Studies, Journalism, Math, Metro Transfer Academy, Physics, and Visual Media Design. The Ocean campus has a general array of basic courses. The Southeast Center has its own student ambassador program. 3. What types of certificates and degrees are available at City College of San Francisco? City College offers Associate of Arts and Science degrees in all of the above-mentioned disciplines. 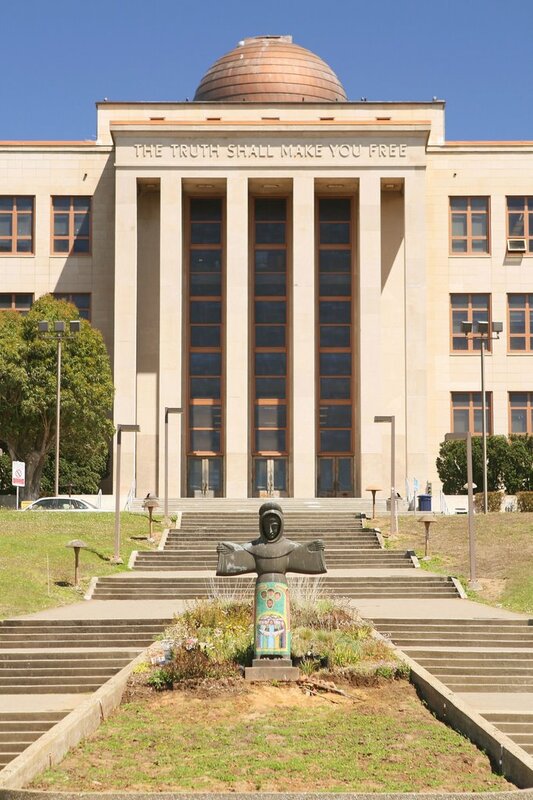 Roughly 95 percent of the CCSF faculty hold masters degrees, and at least 250 hold doctorates. Students working toward their bachelor's degrees can easily transfer credits from courses taken at San Francisco City College. Even occupational certificates might be used as transfer credits toward a degree from a university or a four year college. 4. Who should enroll at City College of San Francisco? San Francisco City College is a viable option for students of any age who live in or near the city of San Francisco. People of middle income who are trying to earn university degrees can save a lot of money on their higher educations by first attending a two year college like CCSF. After two years at CCSF, students can transfer to any of a number of four year colleges. City College also features more than 100 occupational certificate programs, by which students can either find skilled labor or improve their skills at existing jobs in order to earn a higher salary. 5. 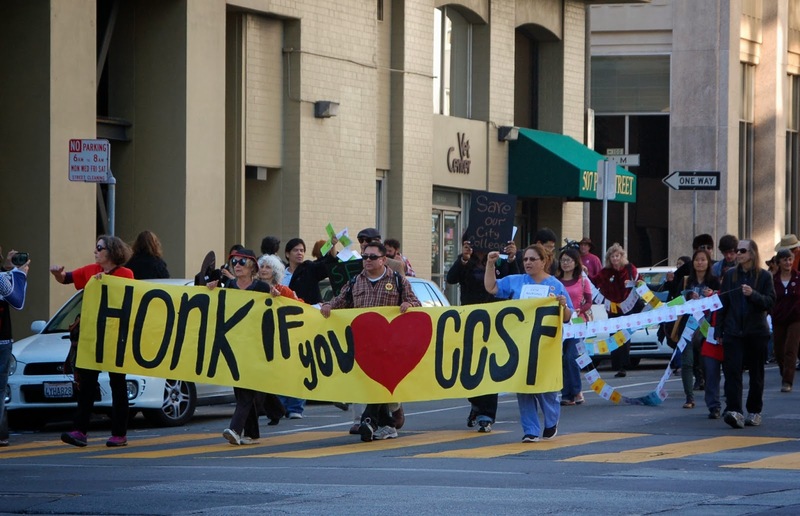 Why attend City College of San Francisco? San Francisco City College is a convenient, cost effective alternative to a university education. People don't save much money paying Bay Area rent. So they might as well save money on a college education, while also learning skills that will help them earn higher pay rates. Other benefits of attending CCSF include setting your own schedule, easily accessible campuses, and the opportunity to live in (or near) one of the greatest cities on earth. 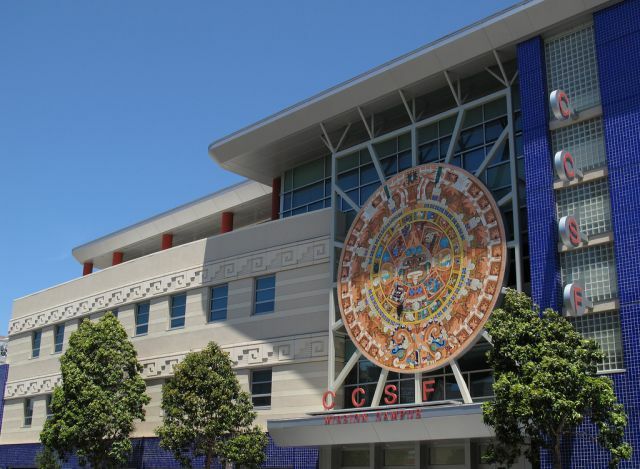 CCSF is a super accessible, cost-friendly college option. Still, if it turns out that San Francisco City College doesn't have what you want, other Bay Area community colleges include College of Alameda, Laney College in Oakland, Chabot College in Hayward, Diablo Valley College in Pleasant Hill, and Santa Rosa Junior College, among others. One of the best features of CCSF is that the tuition is comfortably affordable, especially for California residents. 6. How much does it cost to attend City College of San Francisco? According to the CCSF website, the cost of tuition to attend San Francisco City College is only $46 per credit for California residents, and $233 per credit for out of state residents. Financial aid in the form of grants, loans, and work-study programs is available. Other fees and deposits may also apply. For example, there is a “health fee” of $17. 7. How long does it take to earn a degree or certificate at City College of San Francisco? Normally, it takes up to two years of successful full time enrollment at CCSF to earn either an Associate of Arts and Science degree or an occupational certificate. However, the choice is yours how long it takes. Students can enroll at CCSF on a part time basis, thereby taking longer to earn the degree. Or they can pump up the volume by taking extra classes, thereby earning their degrees sooner. 8. What are the City College of San Francisco campuses like? On-campus student activities at CCSF include more than 80 clubs and student organizations. The student activities office funds and supports programs such as the Book Loan Program, the Family Resource Center, the Multi Cultural Resource Center, the Queer Resource Center, the Student Health Center, the Women's Resource Center, and others. The CCSF campuses also feature fitness centers, and they oversee a number of nationally ranked intercollegiate sports teams. CCSF teams compete in the Coast Conference, as well as with other colleges. Among the sports at CCSF are baseball, basketball, cross-country, football, soccer, softball, tennis, track, badminton, volleyball, and judo. The CCSF football team has won 8 national championships. Other on-campus opportunities include a TV and radio station, a student newspaper, and more than 70 computer labs, as well as live music, dance, and theater performances. 9. What are the City College of San Francisco neighborhoods like? The Chinatown / North Beach campus of CCSF is located just one block away from Columbus Avenue, a street famous for its wonderful Italian restaurants and delis, coffee shops, and dessert cafes. The area northeast of Columbus Avenue is an Italian neighborhood. The area southwest of Columbus is Chinatown. Shop your socks off! Try to find time for your studies. The Civic Center campus of CCSF is in a cultural neighborhood, featuring The Art Institute, the Strand Theater, the Orpheum Theater, the Golden Gate Theater, the historic Warfield, the San Francisco Public Library, and the Asian Art Museum, among other high minded attractions. There's also a BART station very nearby, but all these points of interest are within easy walking distance of the Civic Center campus of CCSF. The Downtown location of CCSF is jam packed with nearby attractions. Walk to Yerba Buena Gardens, Union Square, and the Metreon Theatre, as well as countless stores, restaurants, and art galleries. The Evans campus of CCSF is located in the Bayview section of San Francisco, conveniently situated just two blocks from a 3rd Street light rail transit stop. There are many good places to eat on 3rd Street. The Fort Mason neighborhood of CCSF features piers, harbors, and a bookstore so gigantic it is housed in an airplane hangar. There is also a Safeway very nearby. The Gough Street location of CCSF is situated less than a block away from Market Street, featuring all the shopportunities Market Street is famous for. The John Adams Center location of CCSF is located just a block north of San Francisco's world famous Golden Gate Park (the panhandle, to be exact). Two blocks north of this CCSF campus is the University of San Francisco. In the Mission district location of CCSF, many taquerias and Mexican bakeries fill this neighborhood, as well as numerous conveniences such as a Walgreens pharmacy and a bank. The Ocean campus of CCSF is located near a Whole Foods market and the beautiful Balboa Park. Conveniently, the campus is also right near the Balboa Park BART station. The Southeast Center of CCSF is located just a few blocks southwest of the Evans campus, just on the other side of 3rd Street. 10. Does City College of San Francisco offer distance learning? Yes. Online classes are perfect for working students, parents, or just anyone who finds it more convenient to study online. Some courses are fully online, while other courses are a hybrid of online and classroom instruction. However, online classes are not self-paced, and require the student's regular participation. Online classes are essentially like face-to-face classes, in that they involve assignments, quizzes, and exams. Also, online classes follow the regular semester schedule. Deadlines must be met. This fall's collection of online courses at CCSF features classes in Anthropology, Art, Asian American Studies, Astronomy, Biology, Broadcast Electronic Media, Business, Business Law, Child Development, Computer Science, Culinary Arts, and Economics, to name only a few. Most classes at CCSF feature at least some online capability. 11. What is the contact information for City College of San Francisco? You can contact the main switchboard of San Francisco City College by calling 415-239-3000.